This was the funniest thing to watch Jimmy with the straw. 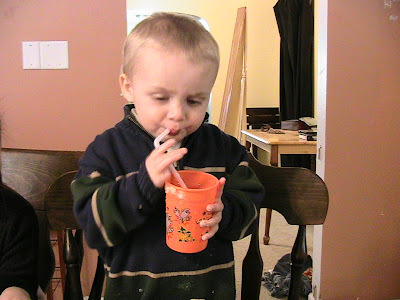 He would pick up the cup, and try to get the straw into his mouth without touching the straw. He'd twist the cup around, trying to aim it in his mouth, but the straw would lean away. 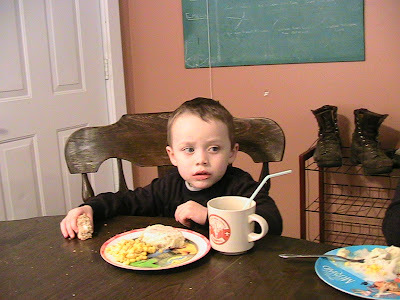 No matter which way he turned the cup, the straw kept eluding him. Funny to watch. He finally did get it in his mouth though. Here's Joe with his dinner. I think he just ate the bread and the drink. The potatoes didn't get touched. The corn got eaten, but not by Joe. Jim came over later and raided his plate. Dogs and toddler are good for those kinds of thing! And here's Eme. While the food may not have been a hit, the Soda was a great success. We had 3 cans left over from when the kids had the stomach flu a week or so ago, and they wanted soda with their dinner. So I split the cans between the 5 of them, and they were in hog heaven! With straws to boot! They loved it. Jim looks like how we remember Joe! He sure is getting big! 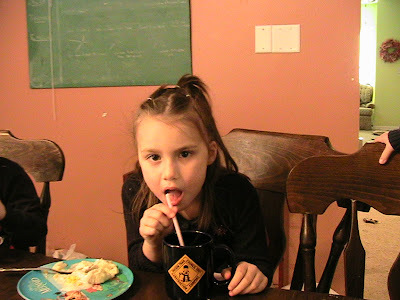 I loved the pictures, especially the one with Eme drinking out of an Oregon Trail Council Day Camp Mug. Just like our house!